We have been having the wackiest weather the past few weeks! From rainy and high 30s/low 40s to sunny and mid to upper 50s/60s. I can’t keep up! I’ve started layering up, that way my outfits are more accommodating to the ever changing temps. After a week straight of rain, I was so excited to see it clear up and warm up this past weekend. If you haven’t checked out August Wrinkle, do so now! They have quickly become one of my favorite online boutiques for their charming and unique high quality pieces. Previous Post Weekend Getaway and a Giveaway Winner! Love your dress! I love how you paired it with biker boots! So cute! Love the dress and the outfit. 🙂 Our weather has been a little wacky too. Random snow storms in the middle of sunny and high 70's. haha! That's fall for you. Cutie! I MUST find my jean jacket. Lovely dress and I love that you wore it with a denim jacket. Great boots, too. That dress is absolutely GORGEOUS! I love it with the boots and jean jacket. August Wrinkle is one of my sponsors, too! 🙂 Aren't they awesome!!! AND one more giveaway!! Visit my blog to enter both! The weather has been super crazy! I love the print on that dress and the necklace is so pretty. Love this outfit! lovely dress dear! <3 looks great on you! I've never heard of August Wrinkle, thanks for the tip! Cute look! 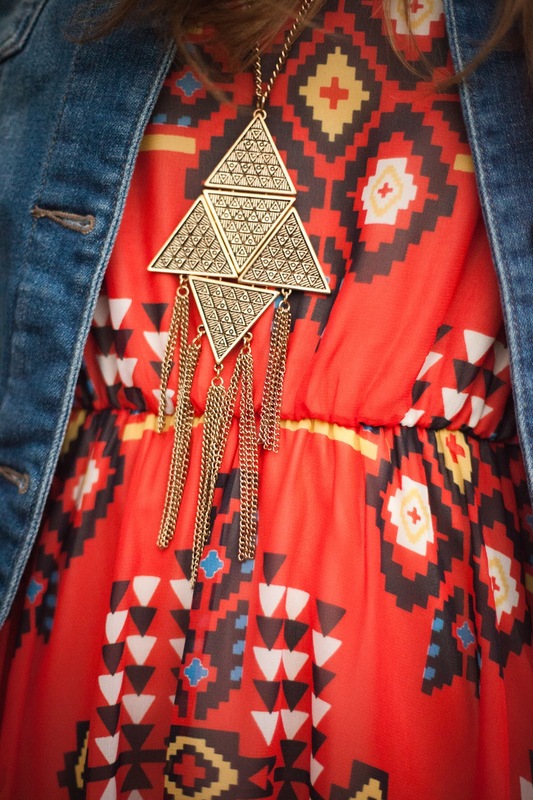 Loving the print on that dress and your necklace! Enter my Naked Palette Giveaway! adorable dress! Loved the jacket! No wonder you are obsessed with that dress! I AM TOO! It looks fabulous on you1 The high-low hem and print are phenomenal! I haven't heard of August Wrinkle, but I am 100% going there right now to check it out! this is such a great outfit. i love the combination of this wunderful summer dress and your black boots. it loos soo awesome and your necklace is just great!! The denim goes perfectly with that vivid dress, adore this look! I feel yo on the wacky weather… it was 84 on Friday, and now it's 37 degrees. What!? Haha, oh well. 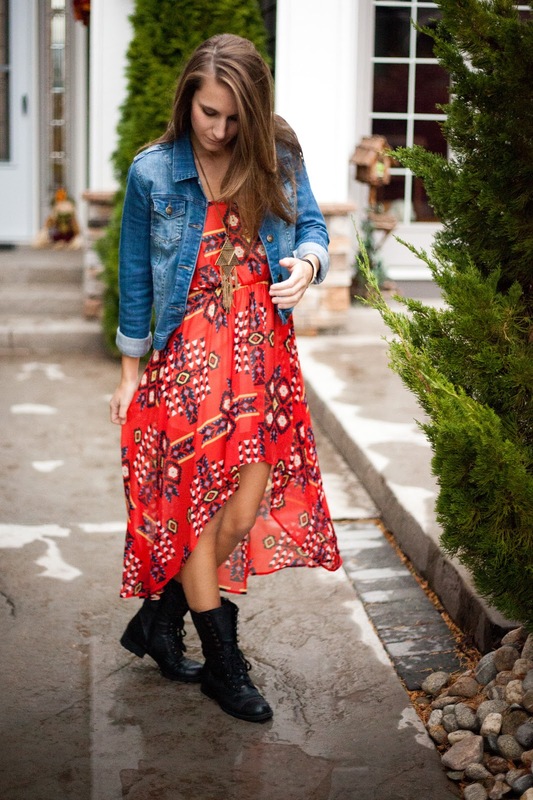 That asymmetrical hemline is sooo cute… and I love the boots you put with it! Such a cute dress! I love the high-low cut of it, too! This is such a beautiful dress and it fits you wonderfully! I LOVE your shoe choice too – the boots are an amazing addition, especially transitioning a summery dress into the colder season. And you totally picked the perfect necklace too! I am your newest follower,if you like my blog feel free to follow me as well. 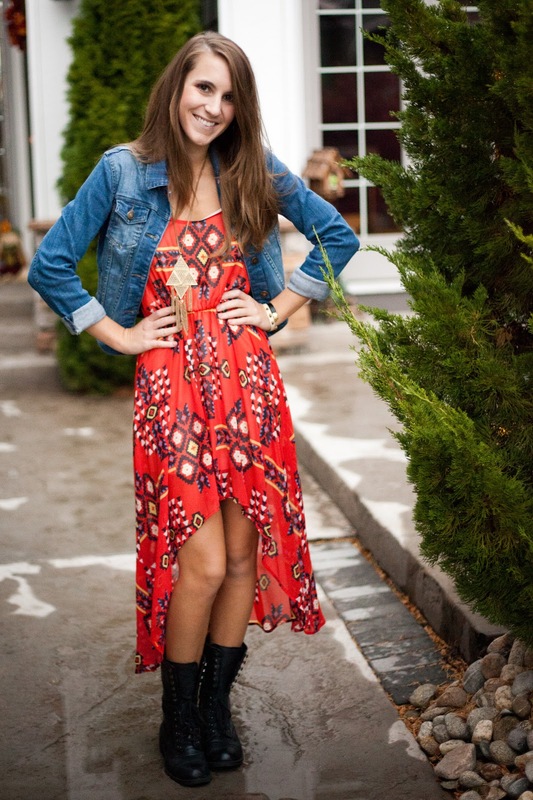 I love the flowy dress paired with the tough boots. Such a cute combo! You are so naturally beautiful that everything you wear looks amazing on you! 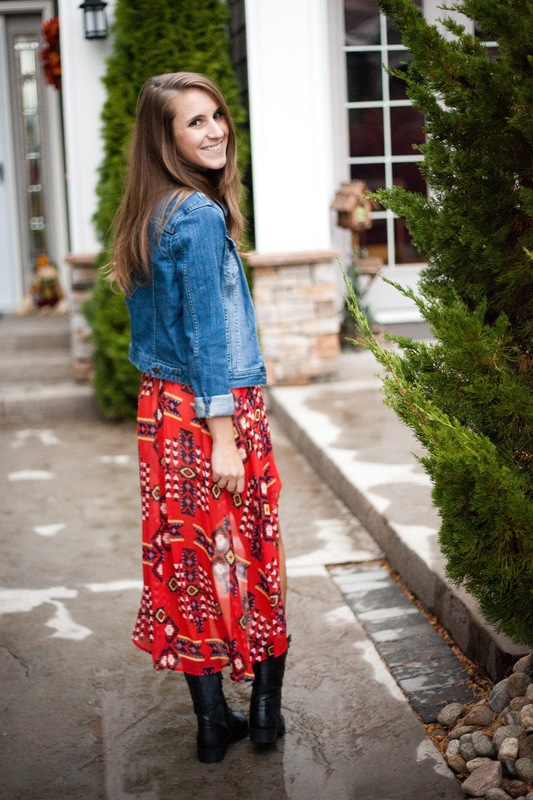 I really love this tribal dress-the red is gorgeous and it elongates your legs! Loving that dress, reminds me of a hankerchief and I love it! Thank you for visiting my blog.. Following you too! 🙂 Kisses from VV!! 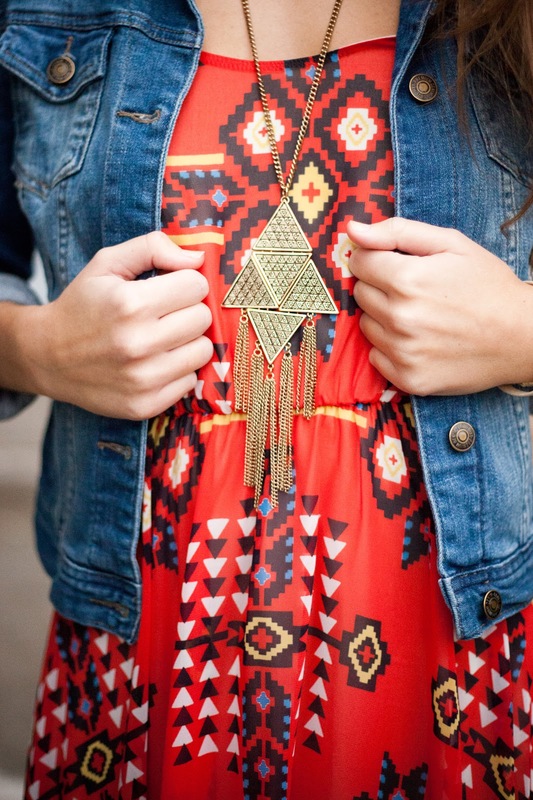 You look so gorgeous in this tribal print dress! And I love the necklace, it goes perfectly with the dress. Your dress is a dream girl! 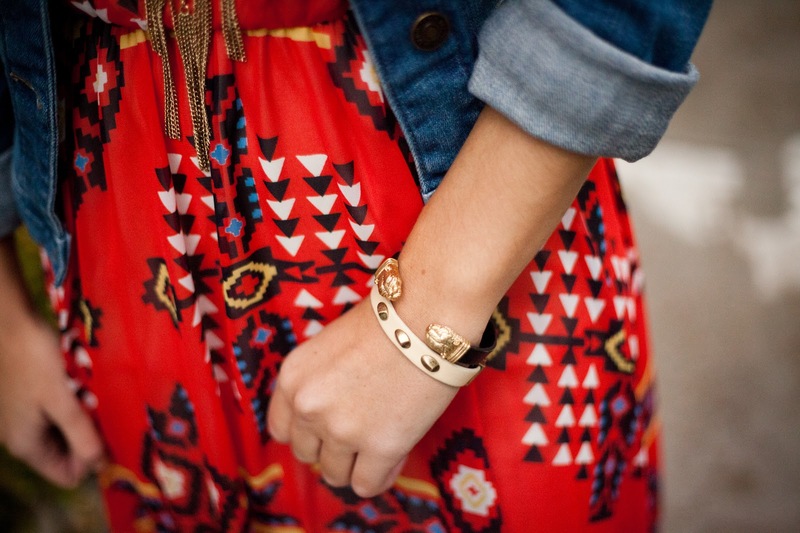 LOVE your tribal print dress! Just found your blog, and am loving it already. Hope you'll check mine out. Wow. Really amazing style. I like the colors. Great and nice blog. Thanks for stopping by the blog! I made it through Sandy! A little power outage, but nothing major thankfully! 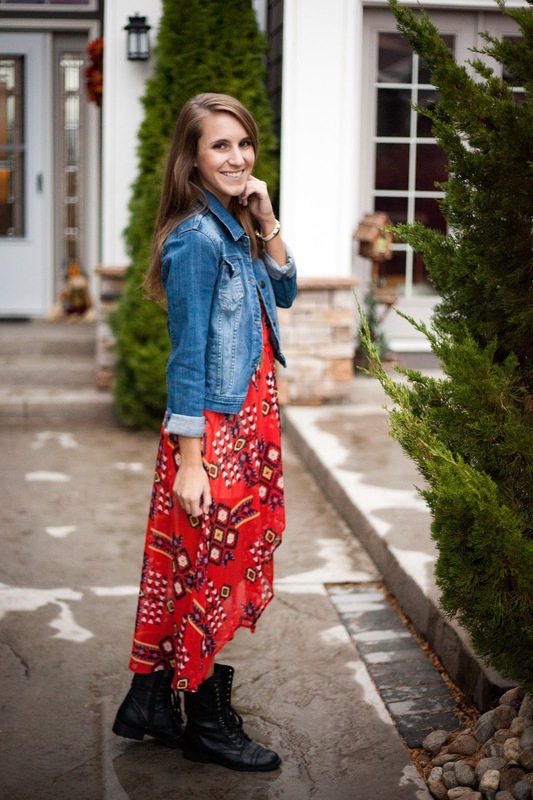 Loving this dress, and how you styled it– great color! In love with that dress…and love how you layered it. hai dear, thank you so much for following me! Awesome outfit, what a beautiful dress! Mind if we follow each others blog? Gorgeous dress 🙂 I really love how you've styled it with the boots and necklace for an edgier look !! CUTE cute outfit! I love it! Gorgeous dress, love you you paired it will those boots. I would have never thought to do that, but you make it look so darn cute! Happy Friday dear! Pretty dress, i love the high low hem and colour! Cute dress and necklace ! The dress looks really good and nice outfit!!! 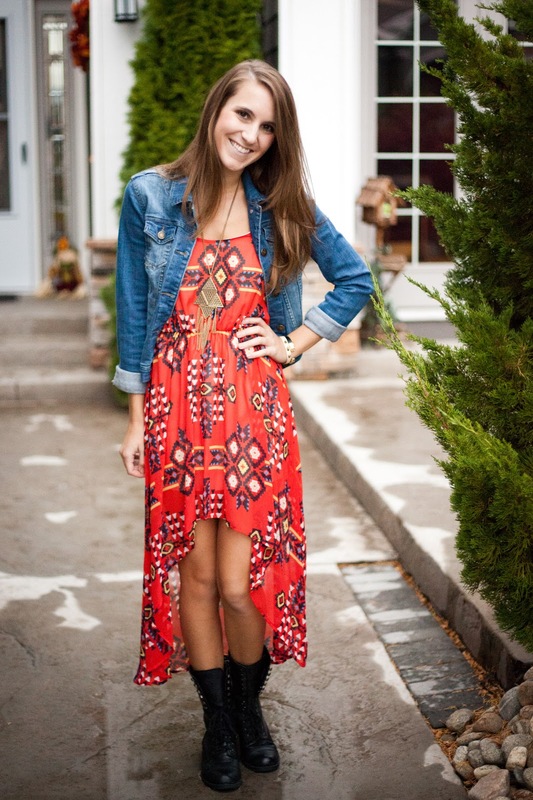 The tribal print dress looks so cute with boots!